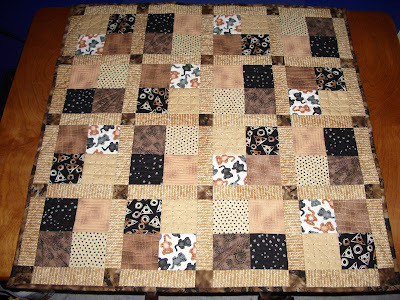 Here are some photos of my very first quilt. It was inspired by Owen & Weasel and I made it as a baby gift for my neighbours (Owen's owners) when their son Daniel was born last year. 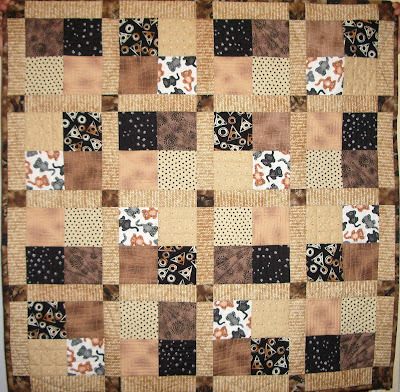 I didn't want this quilt to be a traditional baby quilt, so I chose to use a more sophisticated colour palette of black, brown, beige and cream. I wanted it to have a "cat theme" without being too "catty" if you know what I mean....Both of Daniels parents are quite scholarly and academic - they have an entire wall of their living room covered with books! 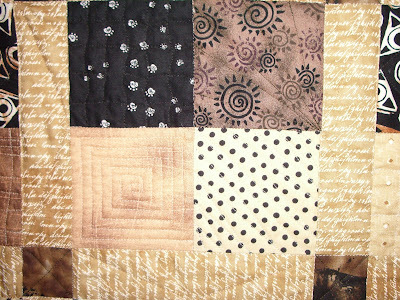 So, when I found the beige fabric with script as a pattern I thought it would be perfect. The brown I associated with coffee which was perfect because Daniel's dad was working part time for Starbucks while completing his Masters in Theology. I was very proud of my first attempt at quilting and it inspired by second frog quilt which I have photos of a few posts below. That's all for today. Have a happy and safe long weekend (we will be celebrating BC Day here in British Columbia on Monday)!